The heart of the oldest part of Dunkeld is The Cross, where the High Street broadens out to flow either side of a central area that was once home to the Mercat (or market) Cross. 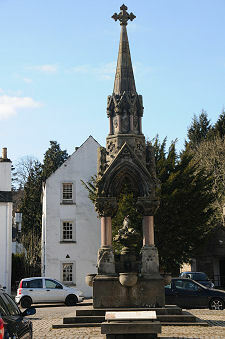 Since 1866 The Cross has been home to the Atholl Memorial Fountain. 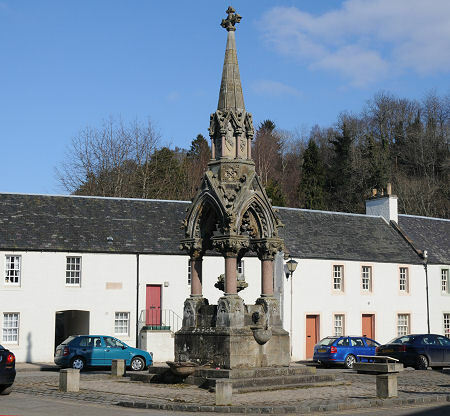 The Atholl Memorial Fountain was funded by public subscription and placed here in memory of George Augustus Frederick John Murray, the 6th Duke of Atholl, who had died on 16 January 1864. The 6th Duke had been Deputy Lieutenant of Perthshire and was a Knight of the Thistle. In 1844, when Queen Victoria stayed at the family seat of Blair Castle the 6th Duke so impressed her with his Atholl Highlanders that she gave them the formal status they have retained ever since. Much of Dunkeld lay within the family estates and the 6th Duke is best remembered here for providing a piped water supply for the town. Until then residents had to draw water from the River Tay. On his death the grateful residents paid for a highly fitting memorial in the form of a fountain. The fountain was designed by the Perth-based architect Charles S. Robertson, with sculptures by John Rhind. 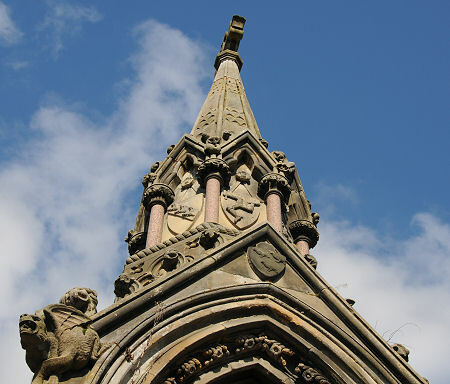 The Duke's position as Grand Master Mason of Scotland was reflected in the many Masonic symbols on the fountain, alongside family crests, gargoyles and more. The end result is highly decorative as well as serving a practical purpose. The water that flows from the fountain in summer today is not drinkable, but when first built it could serve both passing humans and horses. The fountain was passed into the care of the National Trust for Scotland in 1991 by the 10th Duke of Atholl. They have since restored it as they had previously restored many of the smaller houses in this part of Dunkeld in the 1950s and 1960s.